June 2008 - In the last few months, Tiger Woods has won nine out of the 12 golf tournaments he has entered. So who cares? Whenever he tees it up, it's Tiger against the field, and Tiger always wins. But Tiger has met his match. While his mind was willing, his body has suffered a breakdown. The medical story goes like this. In the midst of his latest winning streak, Tiger ruined his left knee, tearing the anterior cruciate ligament (ACL) and damaging the cartilage. Most people can't easily walk with this injury; Tiger played on. In mid-April he underwent arthroscopy to trim the damaged cartilage and began golf practice almost immediately. Without his surgeon's blessing, he played and won the USGA Open 2008. Only afterwards was it revealed that he had sustained a stress fracture in his tibia. The pain on his face could now be understood. It is time to pay the piper. Tiger is done for the year, with knee reconstruction surgery and months of rehab in his future. One injury is plenty- but two? 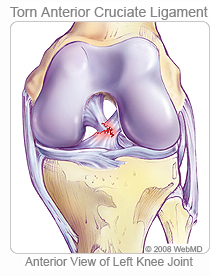 ACL tears are the nightmare of running backs and basketball players. The ligament is one of four that hold the knee together and allow it to flex and extend on the right direction. While the medical collateral, lateral collateral, and posterior cruciate ligaments are important, the anterior cruciate is the star. It gets the press. Tear it and you're done for the season. Reconstruction with arthroscopic surgery is an art, and the recovery time is measured in months. Not only does the knee need to get all its range of motion back but the muscles that move the knee -the quads and the hamstrings- need to get their strength back to protect the knee. A stress fracture doesn't get any respect. You can't see it on x-ray, and it takes a persistent doc to order a bone scan or MRI to make the diagnosis. Bone adapts when it's asked to bear weight. It bends, gives a little, and then springs back to its original shape. Put enough torque on a bone and it breaks. Subject it to a little less force, and the integrity can be damaged just enough to cause microbreaks. Bone is a dynamic structure and can repair itself, if given enough time. However, repetitive injury that exceeds the ability of bone to heal will cause enough microbreaks in an area to cause a stress fracture. Tiger's aggressive training after surgery overwhelmed his tibia, and he developed two stress fractures in his shin bone. Being an elite athlete hurts. In team sports, players often play when hurt because they don't want to let their teammates down. But Tiger is a team of one. The only person depending on Tiger Woods is Tiger. How easy would it be to wave to the crowd and explain that a damaged knee and broken leg made it impossible for him to continue? We would understand. Instead, he played on. Tiger has been dominant in his chosen profession for the past decade, yet it may be this latest victory that seals his legend. He has repeatedly beaten the best golfers in the world and now at the USGA Open 2008, he has beaten the latest challengers: anatomy and physiology. It's time for the man to rest.